I have to apologise for not posting this recipe sooner. You see, it's on constant rotation for dinner in our house and one of Jesse's most requested meals - but somehow I haven't gotten around to posting it until now! 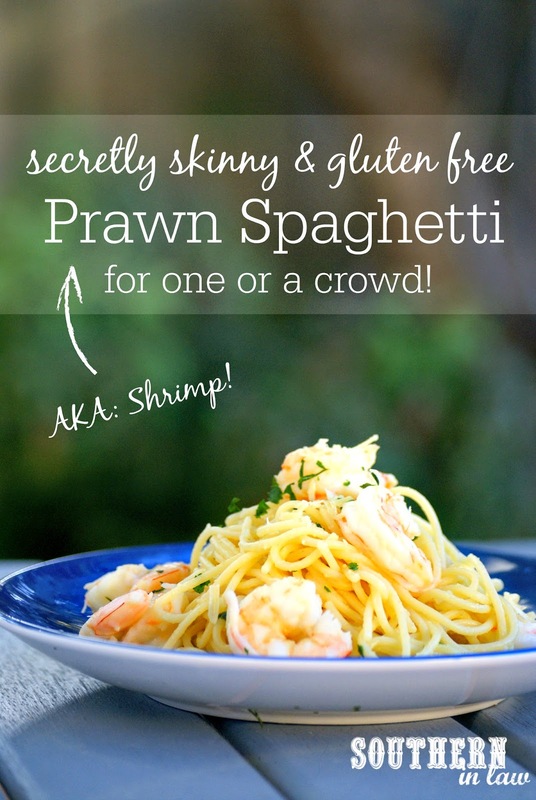 This Prawn (or Shrimp - whatever floats your boat!) Spaghetti Recipe is so simple but tastes absolutely incredible. It's a random creation I whipped up last year all the way back at my birthday when Jesse asked if I could make him something with prawns for dinner. I was having pasta and I decided it would be easy enough to whip up two pasta dishes for dinner so I got to work. To be honest, I wasn't entirely sure how well my creation would work - but I kept on cooking and hoped for the best. Prawns, a little bit of butter, lemon juice, fresh parsley, garlic, salt and pepper - I kept it simple, light and fresh and in just a few minutes a steaming hot plate of pasta was sitting in front of Jesse. I did what I always do when experimenting with new recipes... 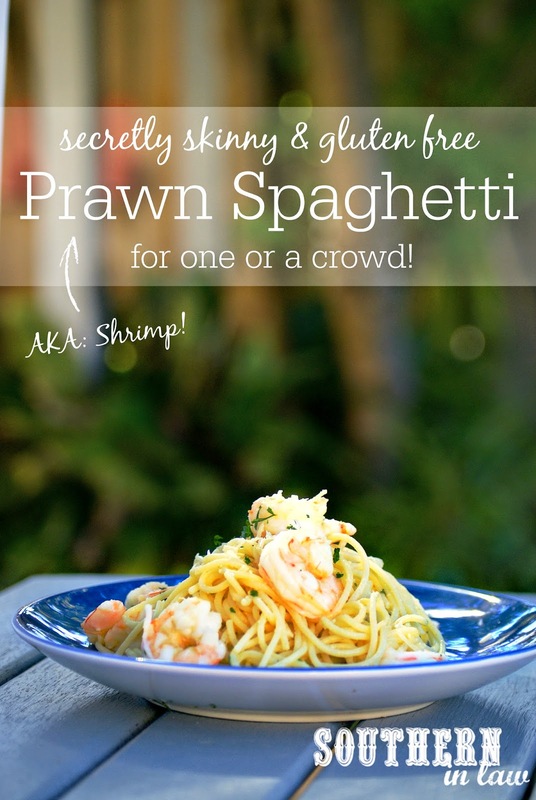 I waited - and the Prawn Spaghetti was a success. A couple of mmmms and wows later and I knew I was onto a winner. This is Jesse's favourite pasta dish and I've made it at least 30 times since that first time, so I'm sure it will become a favourite in your household too! First, cook your pasta according to package directions, drain and rinse and set aside. In a medium to large (depending on how many portions you're cooking) non-stick frying pan or saucepan over a medium-high heat, saute your prawns with half of your lemon juice, flipping halfway through to cook the other side, until pink and cooked through. Once your prawns are cooked, add in the other half of your lemon juice as well as your garlic and herbs. Add in your pasta and butter, tossing to combine everything and heat through your pasta. Mix through half of your parmesan cheese and remove your pasta from the heat, placing onto a serving tray and topping with the additional parmesan cheese. You'll notice that the amounts are pretty loose in this recipe as I never measure anything when cooking dinner! Feel free to experiment with amounts and find what suits your tastes! But tell me, do you like to stick to recipes when it comes to dinner? Or do you like to experiment like me? Also are you a measurer, or do you go by smell/touch/feel/taste? 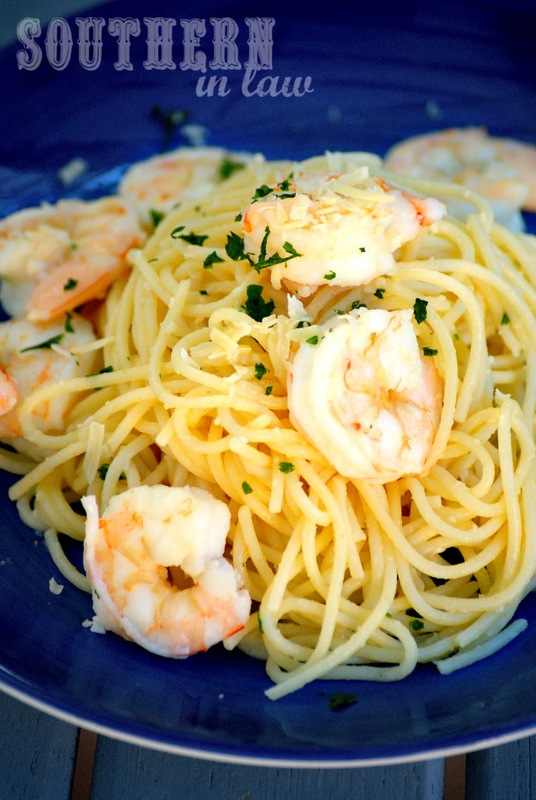 Years ago, my mother used to create a very similar pasta and shrimp dish and it became a staple in our house. I have no idea why she stopped making it over time, but it hasn't made an appearance in quite some time. This reminded me of that, and makes me crave it again! I will even share this on my blog facebook page because I think it's a brilliantly easy and tasty recipe.